Michael Heads, formerly University of the South Paciﬁc, Suva, Fiji Islands, a very big name in and provocative scholar of evolutionary biology and biogeography, in the ‘Taxacom’ Mailing list on 14th December 2015. Journal published for the International Odonatological Foundation, Societas Internationalis Odonatologica (S.I.O.). Odonatologica publishes original papers in all fields of odonatology. It is a semi-annual journal, published on 1st June and 1st December. It is general policy that submitted papers will be refereed. Publication language is English. Odonatologica (2016 Impact Factor: 0.718; 2017 Journal Citation Reports®Science Edition; Clarivate™ Analytics, formerly Thomson Reuters, 2017) is indexed in Current Contents, Science Citation Index Expanded, Zoological Record and Research Alert, and is covered by most of the major abstracting services. See also illustration below. 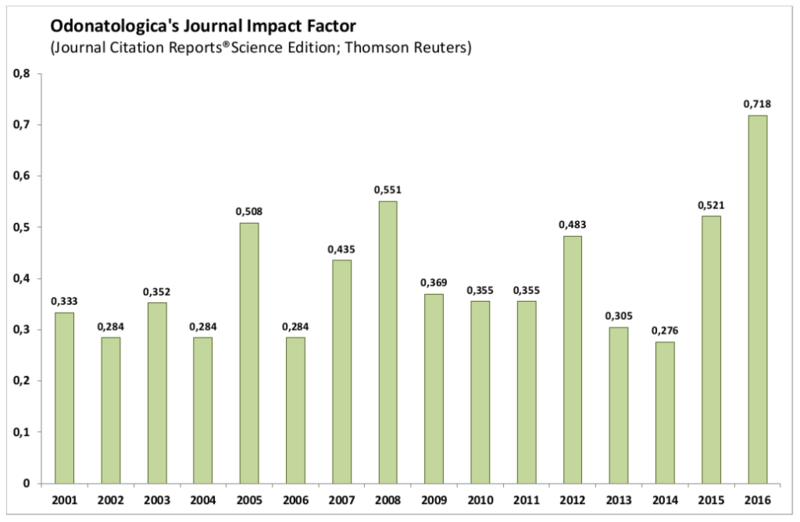 The new Journal Impact Factors for 2016 have been released by Clarivate Analytics on 14th June 2017 (2016 Journal Citation Reports®Science Edition) , and Odonatologica’s JIF has increased again, to 0.718 now!